Grand prize is a trip for two on the Utah Jazz team charter. 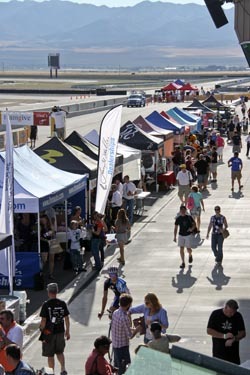 Greg Miller, CEO of the Larry H. Miller Group of Companies, announced a new charitable fundraising event to take place at Miller Motorsports Park this summer. Million Miles at Miller is a 100-mile cycling ride that can be completed by solo riders, relay teams or group teams. Riders of all ages and skill levels are welcome. The ride will take place on Saturday, July 30, 2011. "I am excited that we are taking this step to make a difference in our community," said Greg Miller. "We have found that Miller Motorsports Park is a favorite venue for cyclists due to its smooth, wide surface and the fact that it is safe and free from cars and pedestrians. Using this venue to raise money for charity is a win-win for all of us." -	A fun, unique ride on a racetrack where you can challenge and strengthen yourself. -	Great food available all day for everyone. -	Fun activities for younger riders. -	The new MMP Zip Line will be open during the day with tickets available for purchase on site. -	Visit lots of vendors on the paddock. -	Food station for riders in the GP Garages/Pit Lane. -	Karting sessions will be available for purchase after 5:30 p.m. Participants are required to raise a minimum of $150 which will be donated to Larry H. Miller Charities which funds nonprofit organizations in the areas of health and education for women and children. The person raising the most money will receive the grand prize of an all-expense-paid trip for two to a road game on the Utah Jazz team charter. All types of bicycles are permitted on the course to cycle the 33 laps it will take to complete this century ride. Recumbent bikes, mountain bikes, beach cruisers, unicycles and racing bikes are welcome. An additional benefit of hosting the event at the race track is that families can support their rider by selecting a location along the course route and setting up a blanket, chairs, sun shades or even parking a camper in the RV camping areas. This will allow them to watch their rider pass by several times throughout the event without have to change locations. Miller plans to build on the foundation of this year's event and develop it in to a 24-hour ride in the future. "We hope to have riders participating as individuals or teams stay on the track for 24 hours in their effort to complete a century ride," said Miller. "We have the infrastructure to support such an event and believe it will allow for families make a weekend out of it with all of the other activities Miller Motorsports Park has to offer." To register for the ride, please log on to www.MillionMilesatMiller.com. Volunteer opportunities are available by contacting Carisa Miller at camiller@lhm.com. Larry H. Miller Charities is a nonprofit foundation set up in 1995 to operate as the charitable division of the Larry H. Miller Group of Companies. A positive impact can make a lasting change in the life of a child, family, a community, and ultimately the world. LHM Charities strives to be part of that change and part of the solution by improving the communities where we live and do business. Through relationships and donations, hundreds of children have classes, thousands of books are in Utah schools, mentors have been made available, food and clothing have been provided, and much more.